Maria Montessori developed her philosophy and method amidst the turmoil and destruction of World Wars I and II. She believed that constructing a proper environment which allowed children to learn to be independent individuals would build character and that understanding the cosmos and one’s role in it would lead to the creation of a better, peaceful society. 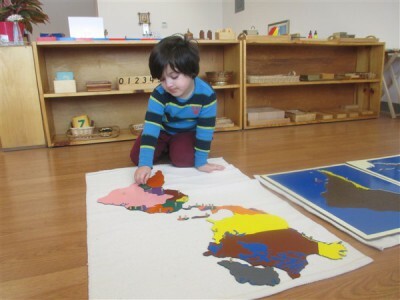 The Montessori Geography curriculum is two-fold: physical and cultural geography. Physical geography discusses the formation of the universe, the creation of the earth, and all its physical properties. Cultural geography is the study of human society and culture. The two together show the child that we are all members of the human race who must co-exist peacefully in order to survive. Enjoy this in depth look as we explain Montessori Geography curriculum materials, activities, and philosophy.